Britain promised to guarantee Scotland high levels of state funding, granting Scots greater control over healthcare spending in a last-ditch attempt to shore up support for the UK before Thursday's vote on independence. The US has bombed militants near Baghdad in support of Iraqi forces, striking close to the capital for the first time in its expanded campaign against IS jihadists. A Taliban suicide bomber rammed an explosives-laden car into a NATO convoy in Kabul today, triggering a massive blast that killed one Polish soldier and two other foreign troops as well as wounding at least 13 civilians. The Pakistan International Airlines (PIA) has suspended its two officials on Tuesday after enraged passengers forced former interior minister Rehman Malik and a Pakistan Muslim League-Nawaz (PML-N) legislator to be offloaded for causing delay in the PIA Islamabad-bound flight from Karachi. China has clinched the multi-million dollar deal to upgrade Male’s international airport for which the Maldives had earlier contracted Indian firm GMR but unilaterally terminated the agreement in 2012. Nationalist response: Scots are not daft; why not before? Britain promised to guarantee Scotland high levels of state funding, granting Scots greater control over healthcare spending in a last-ditch attempt to shore up support for the United Kingdom before Thursday's vote on independence. With polls showing the decision on the fate of the United Kingdom is too close to call, welfare spending and the future of the revered National Health System have formed a central part of nationalist Alex Salmond's case for secession. In a deal brokered by former Labour Prime Minister Gordon Brown, the leaders of Britain's three main political parties said they would retain the funding equation that sustains a higher level of public spending north of the border. "People want to see change," said the agreement, published in Scotland's Daily Record newspaper and signed by Prime Minister David Cameron, Labour leader Ed Miliband and Liberal Democrat leader Nick Clegg. "A no vote will deliver faster, safer and better change than separation," the agreement said. Cameron, whose job is on the line if Scots vote to break the United Kingdom, warned on his last visit to Scotland before Thursday's vote that there would be no going back and that any separation could be painful. British leaders accept that even if Scotland votes to keep the 307-year union, the United Kingdom's structure will have to change as the rush to grant so many powers to Scotland will provoke calls for a less centralised state from voters in England, Wales and Northern Ireland. Swathes of voters in the former industrial heartlands of northern England and Wales depend on state welfare spending while some English lawmakers in Cameron's own party have asked already asked for England to be given more powers. In the face of the biggest internal threat to the United Kingdom since Ireland broke away nearly a century ago, Britain's establishment - from Cameron and the City of London to soccer star David Beckham - have united in an almost panicked effort to implore Scots that the United Kingdom is "Better Together". "There's no going back from this. No re-run. If Scotland votes 'yes', the UK will split and we will go our separate ways forever," Cameron, his voice at times faltering with emotion, said in Aberdeen, the centre of Scotland's oil industry. "Don't think: I'm frustrated with politics right now, so I'll walk out the door. If you don't like me I won't be here forever. If you don't like this government it won't last forever. But if you leave the UK that will be forever." The visit by Cameron, who is also grappling with what to do about Islamist militants in Syria and Iraq, drew a swift rebuttal from nationalist leader Salmond who argued Scotland had a historic opportunity to rule its own affairs. "The next time he comes to Scotland it will not be to love-bomb or engage in desperate last-minute scaremongering - and following a Yes vote it will be to engage in serious post-referendum talks," the 59-year-old Scottish leader said. Non-resident Indians (NRIs) or persons of Indian origin (PIOs) living in Scotland are reportedly divided on which way to vote in Thursday's referendum, which will decide whether Scotland remains a part of Britain or becomes independent. The Indian government's assessment, according to a diplomatic source, is "the community is split on their voting intentions". There are an estimated 23,000 overseas Indians resident in Scotland. They are considerably concentrated in the western city of Glasgow, but are also to be found in the capital Edinburgh and along the east coast in Dundee and Aberdeen. The US has bombed militants near Baghdad in support of Iraqi forces, striking close to the capital for the first time in its expanded campaign against Islamic State jihadists. But in a sign of their growing strength, a monitoring group said the jihadists had managed to bring down a Syrian warplane conducting strikes over their stronghold of Raqa in north-central Syria. The US air strike against IS fighters in the Sadr al-Yusufiyah area, 25 km from Baghdad, came as world diplomats pledged to support Iraq in its fight against the militants and less than a week after US President Barack Obama ordered a "relentless" war against IS. "US military forces continued to attack (IS) terrorists in Iraq, employing attack and fighter aircraft to conduct two air strikes Sunday and Monday in support of Iraqi security forces near Sinjar and southwest of Baghdad," the US Central Command said. "The air strike southwest of Baghdad was the first strike taken as part of our expanded efforts beyond protecting our own people and humanitarian missions to hit (IS) targets as Iraqi forces go on offence, as outlined in the president's speech last Wednesday." 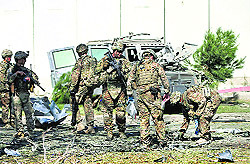 NATO soldiers gave first-aid to bloodstained comrades beside the wrecked remains of a military vehicle that was thrown to the side of the road, while city residents carried injured Afghans to the hospital. The attack was mounted during morning rush-hour traffic outside the Supreme Court and near the heavily-fortified US embassy, on a route used by NATO convoys every day. "We can confirm three International Security Assistance Force (ISAF) members died as a result of an enemy attack in Kabul today," the NATO coalition said in a statement. ISAF does not release the nationalities of casualties, but in Warsaw a spokesman for Polish army said one of its soldiers had been killed and two others slightly wounded. The nationalities of the two other ISAF victims was not immediately known. The NATO force has now 41,000 troops in Afghanistan, with about 29,000 from the US and just 300 from Poland. The fuming passengers went viral on social media. They shouted slogans against VIP culture that allowed special treatment to Malik and PML -N MP Dr. Vankwani to delay the flight for over two hours. PIA shift manager Nadeem and terminal manager Shehzad were suspended by Adviser to Prime Minister on Aviation Captain (retd) Shujaat Azeem. PK-370 was due to depart at around 7pm and scheduled to land in Islamabad around 9 pm. PIA spokesperson Mashood Tajwar speaking to Dawn denied the flight was delayed because of Malik and said that shift manager Nadeem Abro and terminal manager Shehzad Khan have been suspended due to the delayed take-off of PK-370. During President Xi Jinping’s just-concluded visit to the Maldives, China bagged a number of infrastructure projects and also secured Male’s support for a grand plan of 21st century Maritime Silk Road, which was expected to further Beijing’s economic and strategic interests. A housing and a road project involving China was unveiled yesterday which is part of a number of infrastructure projects that include building a landmark bridge and upgrading the main airport in the island country, official media here reported.